The history of white voters with no college degree between 1980 and 2008 provides an interesting story of how demographics and educational attainment have changed American politics and the party coalitions over the past three decades. This history challenges the notion that these voters have been abandoning the Democratic Party in droves and moving toward the Republican Party. In fact, white voters with no college degree have remained remarkably stable in their candidate preferences over the past three decades. What has not remained as constant is the number of white voters with no college degree as a fraction of the overall voting population. These voters have remained an important part of the GOP’s coalition, even as their share of the American voting population shrinks. In August 2012, when PRRI’s Race, Class, and Culture Survey was conducted, Governor Mitt Romney (50%) was ahead among white registered voters with no college degrees over President Barack Obama (33%), while 16% remained undecided. This means that among those who had already chosen a candidate, Romney led Obama by 20 points (60% vs. 40%). This solid preference for the Republican candidate among white voters with no college degree does not indicate a shift away from the norm: in fact, this margin of support is in line with these voters’ preferences since 1980. In 1980, white voters with no college degrees supported the Republican challenger, Ronald Reagan, over incumbent Democratic President Jimmy Carter by a 22-point margin (61% vs. 39%). Nearly thirty years later, in 2008, the same group of voters favored Republican nominee John McCain over Democratic nominee Barack Obama by a similar margin (59% vs. 41%). 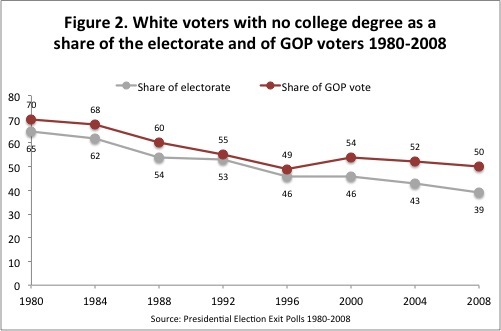 As Figure 1 shows, the GOP share of the vote of whites with no college degree has been fairly stable since at least 1980. 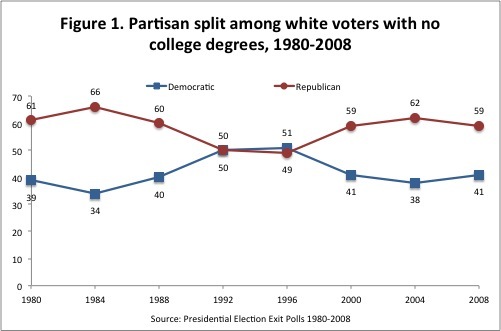 Only twice, in the 1990s (the two Clinton victories), did white voters with no college degree deviate from its 60/40 split between Republican and Democrat. However, in 1980, white voters with no college degrees accounted for 7-in-10 (70%) of the GOP vote, and nearly two-thirds (66%) of voters overall. In 2008, they represented half (50%) of the GOP vote, and only around 4-in-10 (39%) voters overall. What accounts for this striking decline? The number of white voters with no college degree, once one of the most influential voting blocs in America, has been shrinking as a share of the electorate as the result of two important demographic shifts. The first is increasing education rates among whites. In 1980, just over one-quarter (28%) of white voters had a 4-year college degree. By 2008, nearly half (47%) had a 4-year college degree. The second demographic force is the racial diversification of the electorate. In 1980, just 1-in-10 (11%) voters were non-whites. By 2008, racial and ethnic minorities accounted for over one-quarter (26%) of all voters. Non-white voters overwhelmingly favor Democratic candidates, while over the past fifteen years, white college-educated voters have shifted away from the GOP. These two changes have forced the GOP to increasingly rely on white voters with no college degrees. Figure 2 shows that while white voters with no college degrees have always been overrepresented as a share of GOP voters, a pattern that has only increased since 1996. In 1996, when white voters with no college degrees comprised nearly half (46%) of the population, nearly half (49%) of votes for the GOP also came from white voters with no college degrees. By 2008, however, when white voters with no college degrees represented a substantially smaller slice of the electorate (39%), the GOP continued to receive half (50%) of its votes from this dwindling population. White voters with no college degrees may have not become more Republican in recent years. But their importance to the GOP’s electoral goals has increased, even as these voters shrink as a percentage of the electorate.